Measure Up LinkedIn Group members collaborated with me to create this list of the toughest things to measure in business. What are they and what makes them so tough to measure? What makes these so hard to measure? They aren’t framed as performance results yet. Objects in the list above are still just broad concepts or areas of performance. Before you can measure something, you must frame it as a result that you want to improve or achieve or create. Secondly, those hard-to-measure things are phrased with weasel words: quality, value, sustainability, responsiveness, effectiveness, collaboration, morale, impact, maturity, engagement, reliability. The result you want to measure must be written in language that describes something you can observe and therefore have evidence of its existence. Weasel words won’t do. So the problem is not one of measurement, but one of articulation of the results we want to improve or achieve or create. When you can evidence something, you can measure it. How do you make the seemingly immeasurable become measurable? You have to change your language and get ultra-clear about the specific performance results that are a priority to you. What exactly about morale do you want to change? 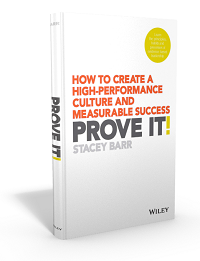 Is it that employees behave more proactively? Or that they talk about the company in a positive way, rather than slagging off at it all the time? What specifically does training effectiveness mean? Does it mean that after training, employees retain what they learned? Or that they put into practice what they learned? 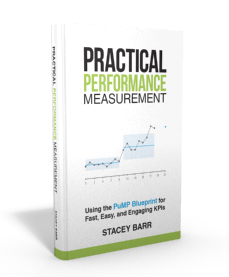 Or that their process performance measures show that by practicing what they learned, process performance is improving? Or does it mean all these things? Vagueness is the enemy of measurement, but also the enemy of reaching excellence. And vagueness is often the reason why those hard-to-measure things appear to be immeasurable. 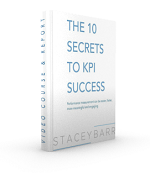 What are you struggling to measure, and how could you make it more measurable now? Share your suggestions on the blog. Just wondering why risk management is considered difficult to measure. There are well-designed processes for identifying key risks (best linked to strategic objectives) and from this defining key risk indicators and also key control indicators. I guess I’m not the first one that raise the idea of bypath the subject to measure, rather measure it outcome. let say you want to scale “creativity”. if one is writing his idea on word documents, a good measure for creativity would be the number of new and original documents this person produced in certain period. Think about employs sick days as a measure of motivation. what about vocabulary and phrases used in documents, to measure the workforce development? Yair, that’s a good example of showing how to make a vague result more specific. You’re exploring what “creativity” means in the specific context we might me interested in. We have to do that if we’re going to make those vague and broad and intangible concepts measurable. Thanks! It may be difficult to measure the items identified by the survey but these days almost everything is measurable e.g. Quality Life can be measured by comparing it against quality of life indices freely available and so can many others mentioned by the survey. It may not be very accurate but will give a good idea about the quality of life whether good, bad or ugly! Stacey, this problem is probably greater when you add the point that words that organizations use doesn’t even mean sometimes what they are supposed to mean. For example, I am an operational effectiveness analyst in an Insurance company. What is effectiveness ? It is producing the intended or expected result… So are they some claims in my company that receive no answer (the reason why we exist after all)… No. So why is my purpose !?!?! When I asked, the answer I got was to help make our operations effective with less resources possible (money, people, etc. )… OH I see, I am really an OPERATIONAL EFFICIENCY ANALYST ! I just want to show with this example that things are tough to measure because people have different ways to define a concept. Go ask to some people what means “creativity”, “quality”, “compliance”, “success”… So I agree with the post, be more specific on what you want to measure. 2-Onboarding : A department once show me a KPI about measuring effectiveness of onboarding for new employees. Since onboarding means : “the process of acquiring, accommodating, assimilating and accelerating new team members [or new employee]”, it was quite a challenge.